Hello friends. I’m headed to Vermont for a week long yoga workshop and am looking forward to reconnecting with my teacher and our community there. It will be nice to focus on my practice and immerse myself in the philosophy and teachings. 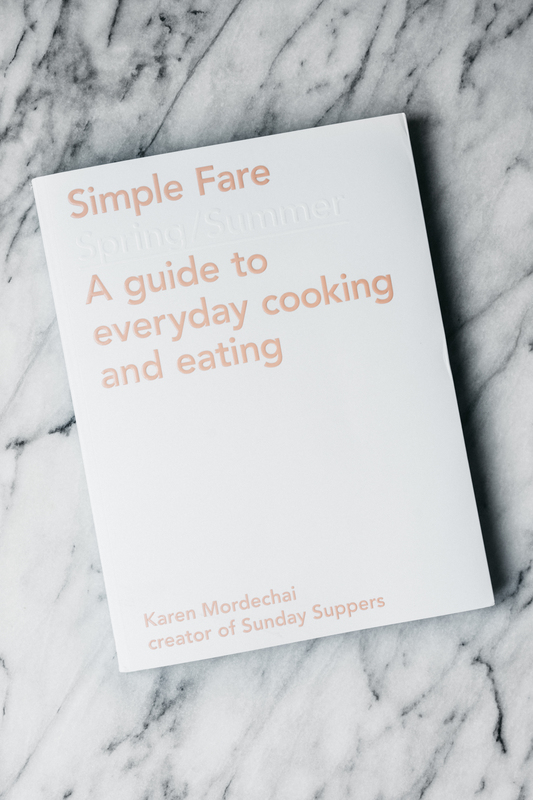 I’m sure I’ll have lots to share with you when I return but for now I want to talk about Karen Mordechai’s new book, Simple Fare. Karen is the creator of Sunday Suppers, a blog and dinner series designed to bring community together around food. I’ve long admired Karen’s aesthetic. Her style is clean, bright, crisp, elegant, and simple. She knows how to let the ingredients shine and takes pride in thoughtful sourcing. In her new book, the first in a seasonal series, she offers simple recipes based on her favorite weeknight meals. My favorite thing about the book, aside from it’s size (it’s designed to function as both a cookbook and a coffee table book, so is much larger than a normal cookbook), is the way Karen encourages the reader to explore and innovate in the kitchen. The recipes are written to encourage you to modify and adapt based on what’s in season and what you have at your disposal. For me, cooking is so much about exploration and invention, so I love that Karen is opening to door to more conservative home cooks and inviting them to get creative. Now, how about this recipe? I’ll admit I’m a newbie when it comes to sahleb. Honestly, I didn’t even know what it was before reading Simple Fare. Let me tell you, it’s pretty much the best thing ever. 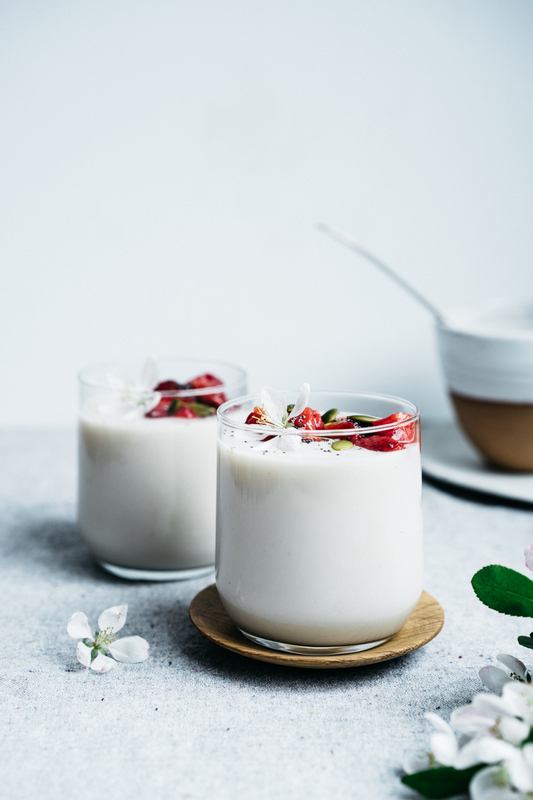 It’s made with coconut milk, cornstarch and a little sweetener. That’s it. 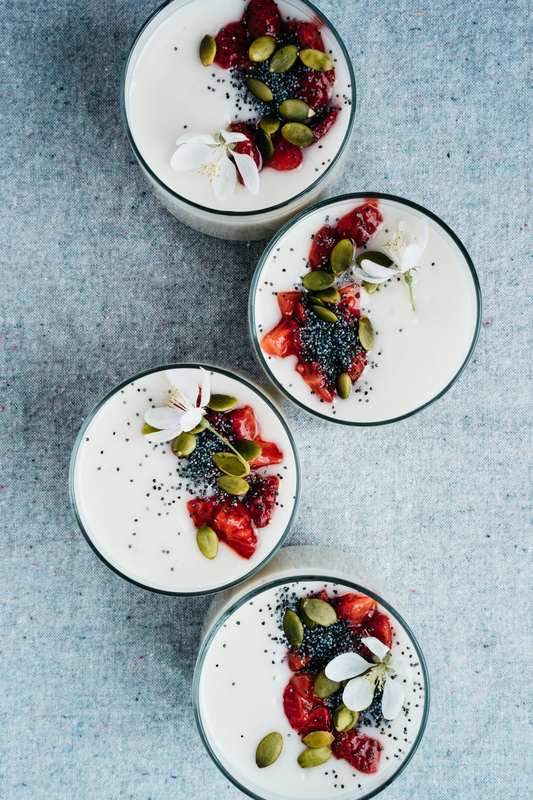 The result is a sweet, luxurious dessert that falls somewhere between pudding and yogurt. I took Karen’s recipe and ran with it. The original recipe suggests using mahlab and rose water, but I added orange blossom water instead. 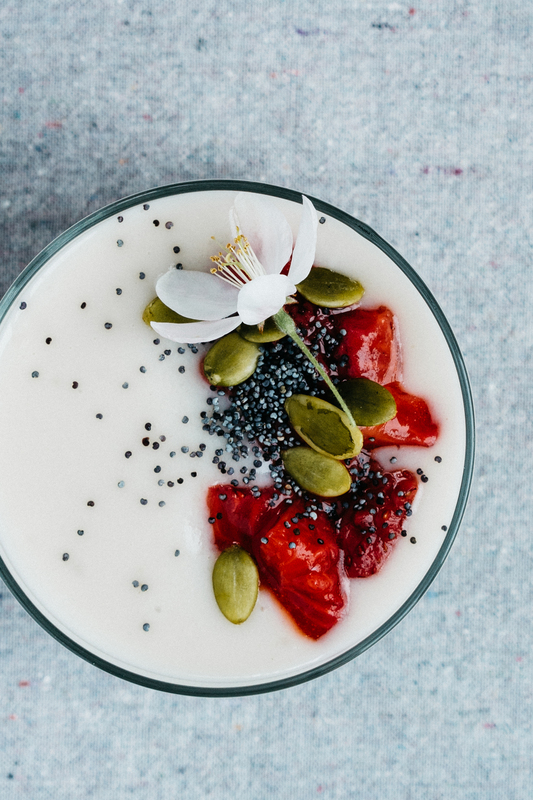 I also changed up the toppings from the original recipe and added strawberries that I roasted in coconut sugar and vanilla and then topped it all off with pumpkin seeds and poppy seeds for a little crunch. I hope you enjoy it as much as I did. 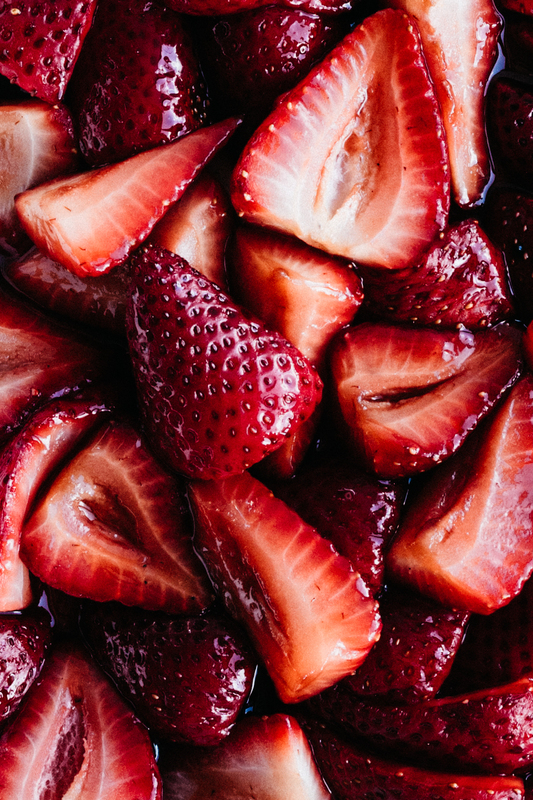 Feel free to modify the toppings seasonally and be sure to check out Simple Fare. Congratulations Karen! 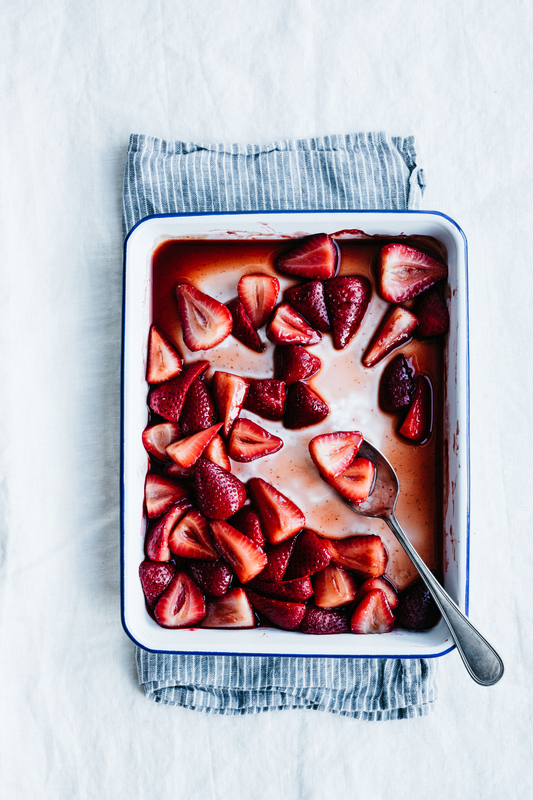 Combine the strawberries, coconut sugar, vanilla, lemon and salt in a bowl and toss well to combine. 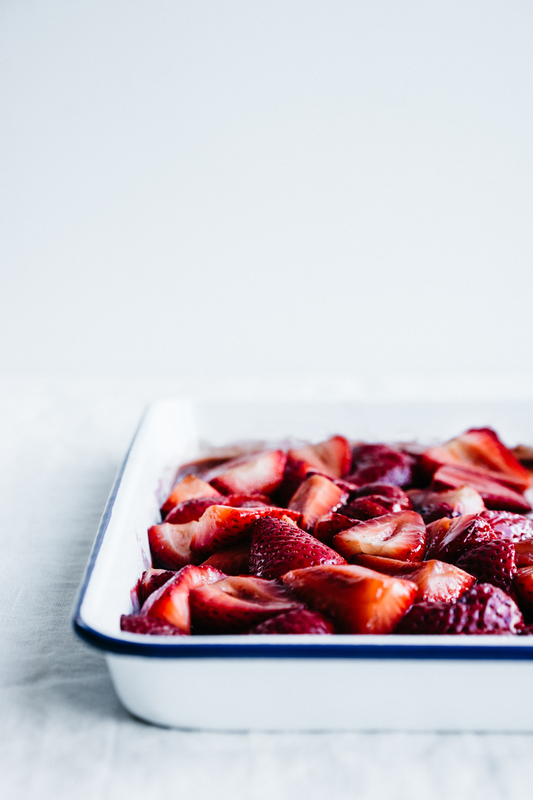 Spread on a rimmed baking sheet and roast for 10 minutes, until the berries are beginning to soften and have released some of their juices. Remove from the oven and allow to cool. In a small bowl, whisk the cornstarch in 1/2 cup of the coconut milk. Pour the remaining 1 1/2 cups coconut milk into a small saucepan. Bring to a boil over medium-high heat. Stir the cornstarch mixture to loosen up any starch that has settled on the bottom and add it to the pan. Reduce the heat to medium. Cook, whisking continuously to keep lumps from forming, for 10 to 15 minutes, until the mixture thickens. Add the honey and orange blossom water and stir to incorporate. 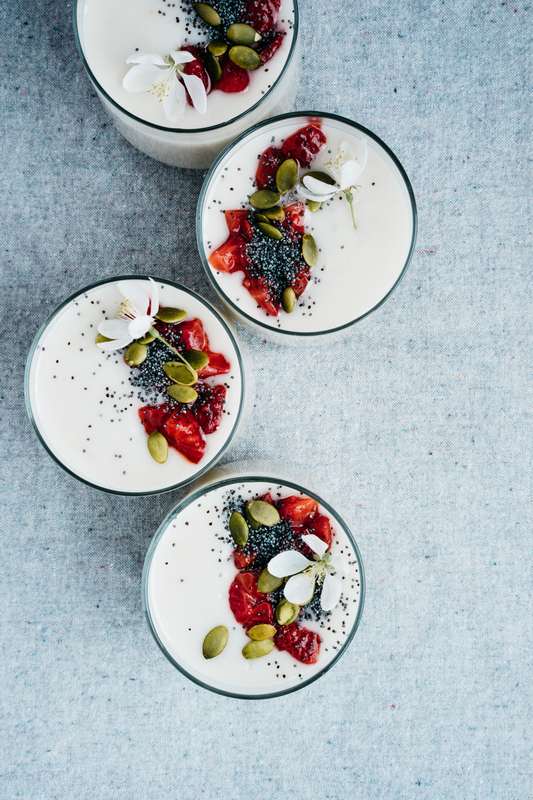 Serve in cups or small bowls topped with the roasted strawberries, pumpkin seeds, and poppy seeds. *I tripled the sahleb recipe to fill the glasses shown in the photos. Wow! Stunning photos! And the recipe sounds amazing! i’ve never heard of sahleb either but recently had some mascarpone cheese to use and found a rhubarb fool recipe which came out great (combined with a little sweetener and sour cream with the cooked & cooled) so i made a blueberry one last night with whipped cream & yogurt cream. also great. 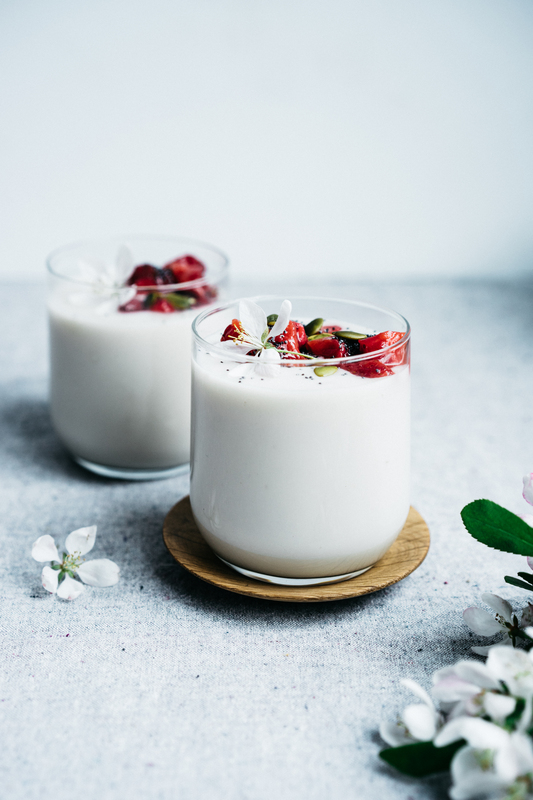 i think this coconut milk version would be a great non-dairy alternative and I could turn the sahleb into a fool…. What a beautiful looking dessert. Such a pretty recipe and that sahleb sounds divine!